Below I present selected findings from our (Lucy Lach, Anne Blumenthal, Bree Akesson) review of social work dissertation research in Canada. This work is now a working paper at the Social Science Research Network. The main objective of this study is to describe the nature of doctoral social work scholarship in Canada over the ten year period from 2001 to 2011. The research is guided by two sets of research questions; the first set uses overall data across the ten year period and provides an overall representation of the output of doctoral dissertations. The second set of sub-questions includes a time component to examine trends. This set of questions offers information about social work knowledge production has fluctuated overt the first decade of the 21st century. The study is is a scoping review of publicly available dissertations (Arksey & O’Malley, 2005). The dataset was created by Rothwell, Lach and Blumenthal (2013) and is available on the Dataverse Network under the name Social Work Doctoral Scholarship in Canada. The dataset is free and can be accessed by writing to the authors for permission. 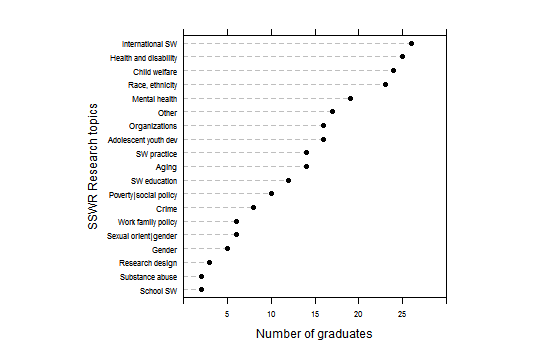 The first step of the analysis revealed the production of dissertations across Canadian Schools/Faculties of Social Work. Results are shown in Figure 1. By far, the University of Toronto has produced the most PhD graduates in the country (n=76). Calgary follows with n=44. 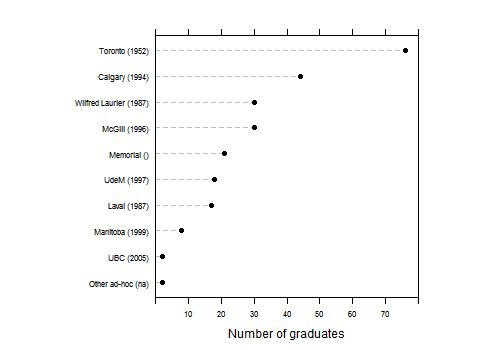 McGill and Wilfred Laurier University tied for the third most graduates (n=30) . The average number of graduates per school was 24.8. The productivity of schools is related to the age of the program. UT is the oldest program started in 1952. The University of British Columbia has one of the newer programs. Second, we wanted to understand the diversity of topics studied in social work. We accomplished this by applying the research topics used by the Society for Social Work Research (SSWR) for abstract submission in their annual conference. Considering the diverse research topics under study in social work, we next examined research method differences across research topics. Each dissertation was coded as qualitative, quantitative or mixed methods. We selected the five most prevalent topics in our list of SSWR research categories (international social work, health and disability, child welfare, race and ethnicity, and mental health) and reported the proportions of method used. The results revealed considerable diversity (see below). 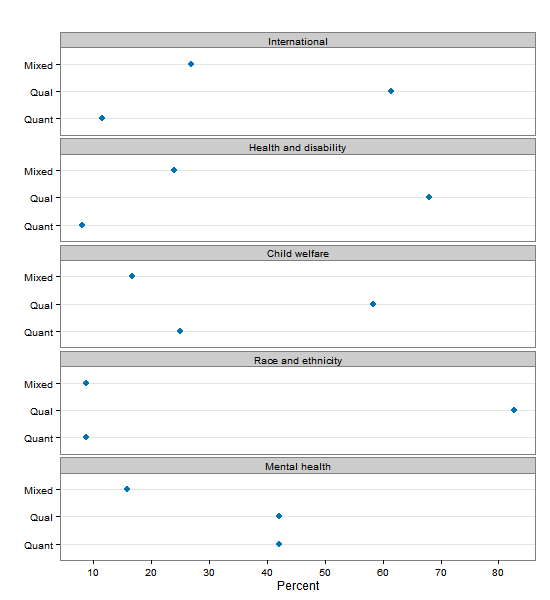 Child welfare and mental health had a much higher than average proportion of studies that used quantitative methods. For dissertations examining race and ethnicity qualitative method dominated. Mixed methods were most common in international studies. Dissertation by research method over time. The next part of the analysis examined trends over time. Figure 3 below shows how research method varies across year. Across years, qualitative methods are the most common by far. The ratio of qualitative to quantitative to mixed studies ranged from highest in 2008 with 23:4:5 to lowest in 2005 7:2:2. The average number of graduates per year in Canada who conducted various dissertations was 15 qualitative, 4 quantitative and 4 mixed. The number of graduates who conduct a quantitative thesis in any given year was never more than 6. A few points stand out. 1. Canada has produced 248 doctorates in social work between 2001 and 2011 (*publicly available dissertations). The University of Toronto is by far the most productive program. It is also the oldest program. 2. Social work dissertations focused on a variety of topics. And there was a strong relationship between research methods and topic studied. Methods employed to study mental health and child welfare are relatively balanced. Race and ethnicity and health and disability are almost exclusively studied using qualitative methods. 3. Across time, qualitative methods dominate over other research methods. There is a very limited supply of quantitative social work researchers being produced in Canada. This work opens several lines of inquiry. 3. Robert Oprisko et al’s work on placement efficiency. 4. Analysis of research methods / institutions by tri-council funding award. We welcome your feedback. Stay tuned for the final paper. Published by David Rothwell on January 9, 2014 at 3:55 pm under Uncategorized. 0 comments. After being here for seven weeks, things have gotten a little strange. Not being a particularly mathematically inclined person, I’ve gradually taken to preferring to reading information in mathematical form, because it reduces the amount of information I have to process. Although it’s fairly clear that I will not be joining the Canadian Mathematical Society anytime soon, almost by magic I’ve started to deeply enjoy the utility and intuition of math. Today was my last day of seven weeks of math classes, much of it focused on matrix algebra. The second session matrix algebra class turned out to be one of my favourite classes here at the ICPSR summer program, due in large part to the accessibility of the material. Professor Pedro Sanchez spent a week going over the singular value decomposition (SVD) with the class. SVD underlies and is connected to many statistical methods, such as principle components analysis (PCA) and factor analysis (FA). It has been especially interesting for me, because I’m learning about SVD in a math class while also learning about PCA and FA in a stats class. To simplify: singular values are the positive square roots of the eigenvalues of a matrix A. To find the singular values of a matrix A, you multiply it by unitary matrices U’ and V so that you achieve a diagonal matrix D, with singular values on the diagonal. I thought I’d share a few resources here about SVD. MIT open courseware has an excellent lecture on SVD that I found really helpful. In terms of application, this article by Sirovitch (2003) explains in a very clear and ingenious way how SVD can be used to provide information on the dimensionality in data matrices. The article looks at the decisions of the Renhquist Supreme Court in the USA, and finds that contrary to the conventional thinking that there are nine dimensions of the court, there turns out to be two dimensions that court decisions are aligned on. Published by Anne Blumenthal on August 8, 2013 at 10:20 pm under Uncategorized. 0 comments. I’m spending the next eight weeks in Ann Arbor, which, aside from its quaint and shady tree-filled streets, is well known as the home of the Michigan Wolverines. What’s perhaps less known (outside academic circles) is that the University of Michigan is home to one of the most advanced social science research institutes in the world, The Institute for Social Research (ISR). 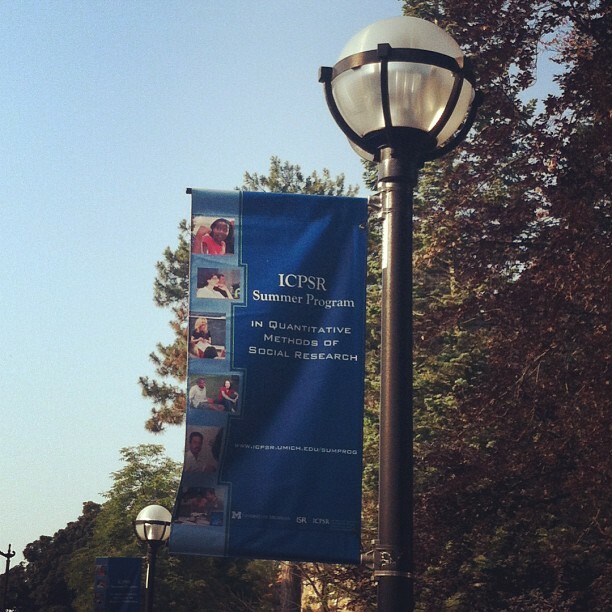 The ISR consists of five separate and independent research centres, one of which is the Inter-university Consortium for Political and Social Research (ICPSR), of which McGill University is a member. The ICPSR manages and curates secondary datasets as well as conducts its own research on how to best curate and manage data. The archive at ICPSR is not only impressively large, but unique and easily accessible to both novice researchers and advanced scholars. Codebooks and data files are all indexed and linked to each other. 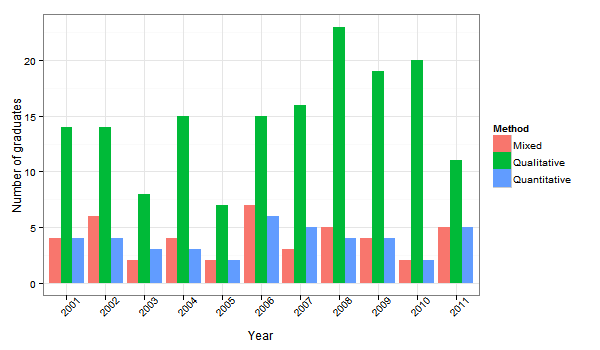 Previous articles written on the respective dataset are also indexed and linked. The whole layout of the site makes working with secondary data less head-numbingly perplexing. So, while I was browsing their site back in the fall, I happened upon the ICPSR Summer Program in Methods of Quantitative Research. The courses at the summer program are diverse, and aimed at scholars of all levels. For example, they offer courses on basic computing to advanced Bayesian methods. Stumbling upon this social science training program made me feel as if I had found a secret garden. Today at orientation my feelings were confirmed when the director of the program, Professor Bill Jacoby welcomed us to not only the world’s foremost quantitative methods training program but also a ‘summer camp for social scientists’. In short, I feel absolutely privileged to be here*, and intend on sharing some of the resources and experiences I gather here on the blog. For me, as someone who enjoys light programming, the main barriers to using LaTeX have been the lack of easy integration with zotero and my inability to figure out how to make it format documents respecting the APA 6th Edition Publication Manual. However, these barriers were at least half-way solved this evening. Zotero exports to BibTex, which is the bibliographic program compatible with LaTeX. Although exporting and creating a BibTex file makes for another step in the bibliographic formatting process for zotero users, it’s not an insurmountable step. I also found, although have not tried, this APA 6th edition template and guide for LaTeX. After having attended the lecture this evening, many things that I struggled with when I “used” LaTeX before were clarified. As is the case with learning any new program or programming language, there are many steps and stumbles along the way. I’m sure there’s a lot more to learn about LaTeX than can be explained in one lecture. But tonight I look forward to starting my journey by installing and playing around with TeXStudio. *I want to take a second to gratefully acknowledge the generous support of my supervisor David Rothwell and the CRCF Travel Fund, without whose support I would not be able to take full advantage of this opportunity. Published by Anne Blumenthal on June 24, 2013 at 11:10 pm under Uncategorized. 5 comments.